Sept 29 – Yesterday, 25 delegates from Royal Thai Embassy has come to Universitas Muhammadiyah Yogyakarta . 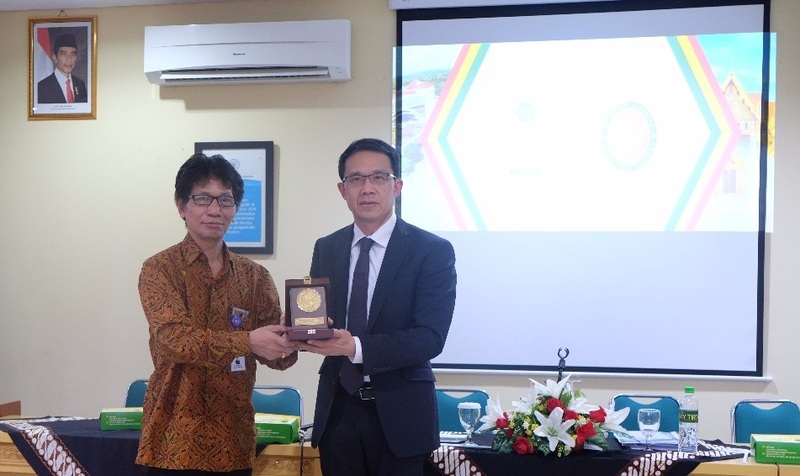 Guests were welcomed by Rector of UMY, Dr.Ir Gunawan Budiyanto, Professor Dr. Achmad Nurmandi, M.Sc; General Director of International Relation Office, Assoc. Prof. Dr. Eko Priyo Purnomo ; and Head of International Relation Office ; Yordan Gunawan, S.H., Int. MBA. at Kasman Singodimedjo Postgradute Building, UMY. This is the first visit from the Royal Thai Embassy discussing education-related issues that focus on Thai students including full time study, student exchange performance, achievement, or problems faced and related matters. The first visit was very meaningful to UMY. “First of all I am very honored that the Royal Thai Embassy willing to come to our University and we would like to thank the trust given to us to provide education to Thai students. The UMY exchange program is intended to provide a new experience for foreign students wishing to gain more experience. In addition to formal education, we also provide various activities that will provide different exposure to foreign students such as culture as well as social experiments. In the future, UMY will also send a number of students to study at few of Thailand’s top universities”, said Rector UMY when giving a welcome speech . Vichit Chitvimarn, Thai Ambassador, mentioned that the visit aimed at discussing some matters relating to foreign student management. “Throughout 2016 to 2017, we have seen improvement of the number of Thai students studying in Indonesia. There was an increase of 40 percent that occurred when compared to previous years. This visit is also an opportunity for us to promote the educational institution we have in Thailand. In addition, we also want to know the life of our students who are studying at UMY because we find there are many Thai students studying at UMY. We want to know how our students conduct their activities here, “said Vichit. In addition, regarding to Assoc. Prof. Dr. Eko Priyo Purnomo, “UMY is very pleased if in the coming years there will be an increasing in the number of foreign student’s especially Thai’s student. We will always take care of the welfare of foreign students especially students from Thailand by providing various welfare including facilities such as scholarships, accommodation and etc. In fact, it is not only that. In every semester, we will also bring foreign students to travel to some places around Yogyakarta because as we know this province is rich in history and culture.” added General Director of International Relation Office.